When Was Last Time You Took A Good Look At Your Tires? Wear and tear is part of a tire’s life, but that doesn’t mean the lifespan must be short-lived. Practicing proper tire care helps improve tread life and save fuel, no matter the season. The onset of cold weather often leads to underinflation, Zielinski said. Effects may take a little while to show up but eventually you may see uneven wear across the tread. “You should perform a visual inspection every month to identify any wear problems,” said Zielinski. Tire inflation and fuel economy are closely related. According to Zielinski, drivers lose 10 percent in fuel economy for every five to seven pounds reduction in air pressure. Check tire inflation monthly to keep tires from riding on the sidewall. Check for cracks, bulges and uneven tire wear. Rotate tires regularly. This helps prevent uneven wear. Rotation method varies as to vehicle you drive and tire. Ask for plugs and patches when fixing a flat, not just plugs. Plugs may come loose and deflate the tire. Check for tire damage anytime your vehicle hits a pothole, curb or gutter. Have you inspected your spare tire recently? A survey by the Rubber Manufacturer’s Association found that more than 70 percent of drivers never check on the condition of their spare tire. 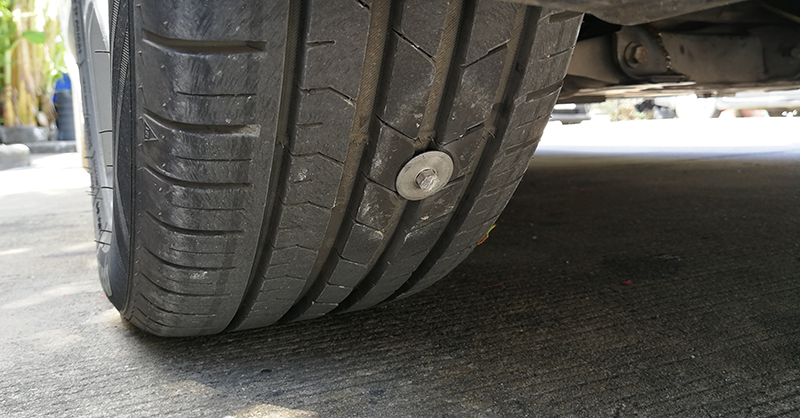 An improperly balanced tire leads to abnormal tire wear and can cause the steering wheel to vibrate as the vehicle accelerates to freeway speed.